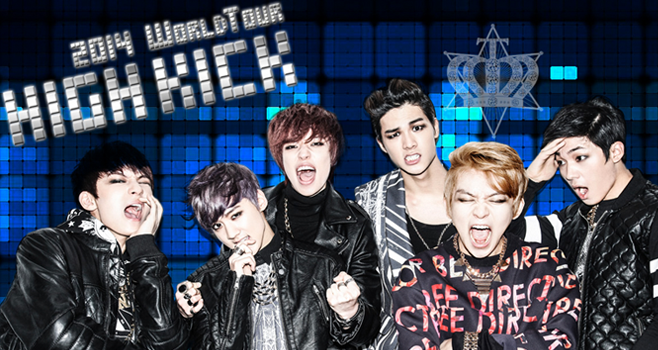 On March 28th, 2014, Teen Top made their way to San Jose, California at the famed San Jose Civic Auditorium. The venue has housed many acts including the who’s who in the world of popular music in addition to hosting many sporting events such as boxing bouts including the likes of champions like Joe Louis and many more. The venue rests in the heart of Downtown San Jose and marked Teen Top’s first visit to Northern California in their stop on their “High Kick” concert. Fresh out of their performance at KCON 2013 in Los Angeles, they showed that they can share the stage with many of the heavy hitters in the KPop world. This was their chance to show that they can shine on their own and headline their own concert. They were able to showcase their abilities and even got to debut their hit single “Rocking” on U.S. soil for the American Angels. Upon entering the venue, it was disheartening to see that the venue was nowhere close to selling out. There were no people in the upper deck area as it was closed off while the floor area was only 2/3 filled. The lower bowl also saw very little people while security and the promoters encouraged everyone not to take any photos. I don’t know what happened, but after the group finally made it to the stage, they must have received a shock that the numbers weren’t what they envisioned. After seeing how many people attended, it went downhill from there. They seemed to be out of it seeming to care less about performing. It was like they went through the motions and weren’t motivated unless it was a sell out. The facial expressions were stoic at best, and they seemed stiff when they were doing their choreography. What made the event a struggle to promote was that at nearby San Jose State University’s Event Center, Taiwanese pop group Mayday was holding a concert which conflicted with the event as many people listen to both CPop and KPop. The Mayday concert went on sale first which meant they may have taken a bite out of the potential crowd for Teen Top’s performance. To be fair, Teen Top has only been around for a few years while Mayday has been around since the late 90’s. As a person who has been around other genres outside of KPop, it was discouraging to see a group act like that because I have attended shows with far less numbers in terms of attendance and the artist performing was putting their all as if they were performing in an arena. I don’t know how they did attendance wise in their other stops in the U.S. I do see that they have promise as a group when it comes to the live performance. They can totally have a better performance as seen at KCON. They perform best when they could feed off massive amounts of people like at KCON. At that time, they just weren’t ready for the big stage by themselves.